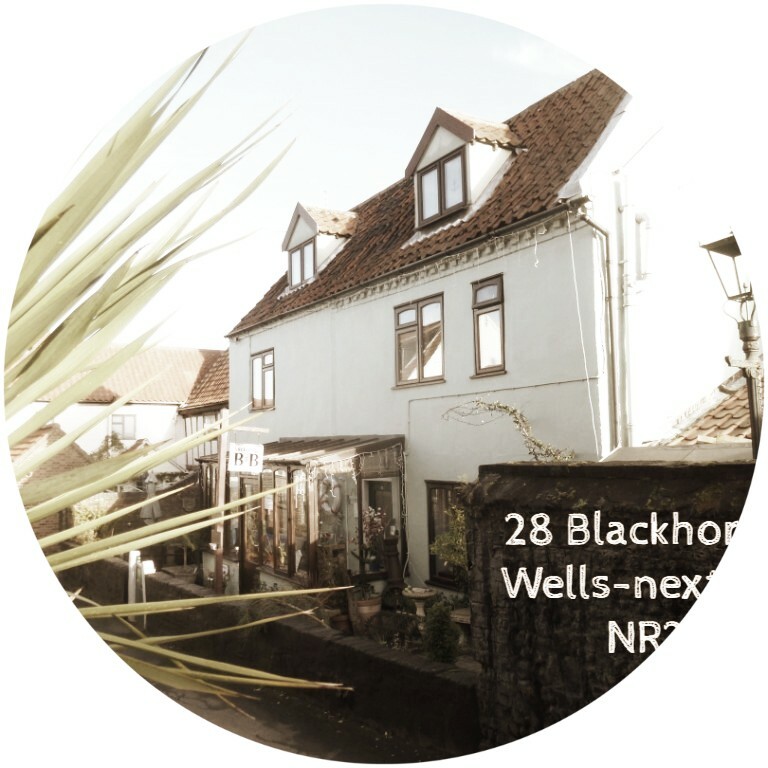 In Wells-next-the-Sea, the B&B is 3 minutes walk to the harbour and the apartment is even closer, a few steps from the sea when the tide is in. 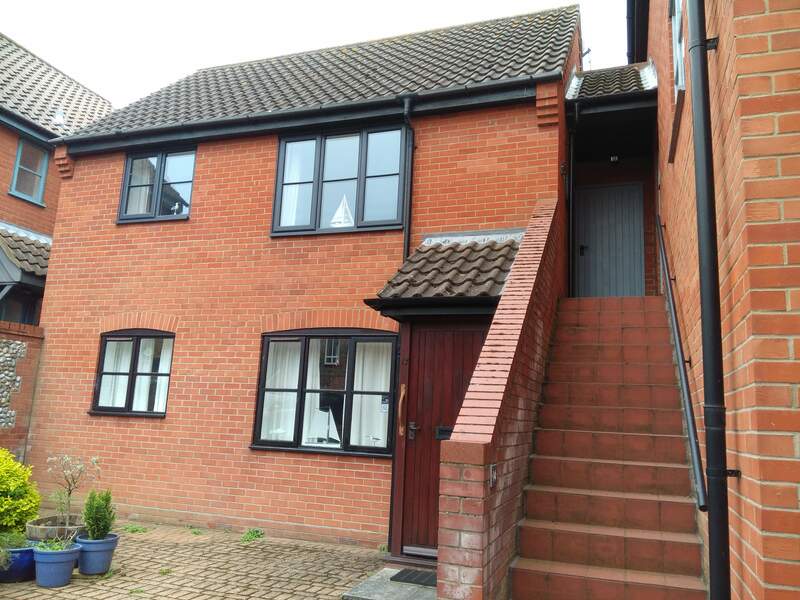 We are ideally located in quiet yards, easy flat 3 to 5 minutes walk to the shops, cafes, restaurants, butchers, bakers, deli etc and a short walk to probably the best beach in Britain, Wells and Holkham. There is a lot to see and do around our beautiful coast and safe haven harbour, you don't need to walk far to be away from everyone and enjoy the fresh air, freedom and amazing wild-life. Once you have parked the car you can leave it there and enjoy this wonderful part of the North Norfolk coast. 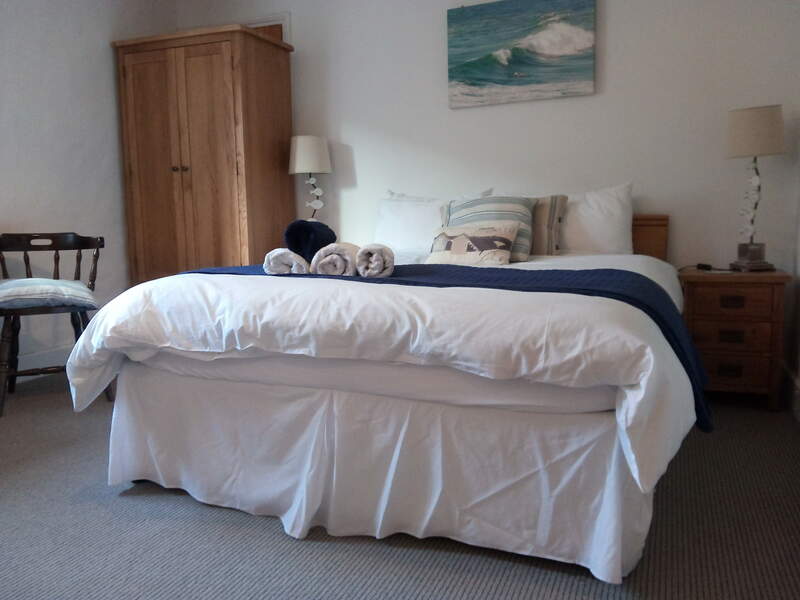 Choose from 3 comfortable king double en-suite rooms, 1 of which is 2 rooms across the whole top floor with partial sea-views or choose our lovely pet friendly well equipped 1 bedroom apartment with parking a few steps from the quay. Pictures and details are below and you can contact me for information, rates and availability by sending me a message on the below or by email and text. There is also a box below to enter your date to check some availability but it does not book it. You can book with just a couple of emails. King bedroom with a small sofa and double aspect partial seaviews across Wells to the harbour, Albatros, Blakeney and the pine trees. Favourite room with many of our guests. 2 Singles in adjoining cabin style room. Or ideal for 2 people wanting separate sleeping rooms. 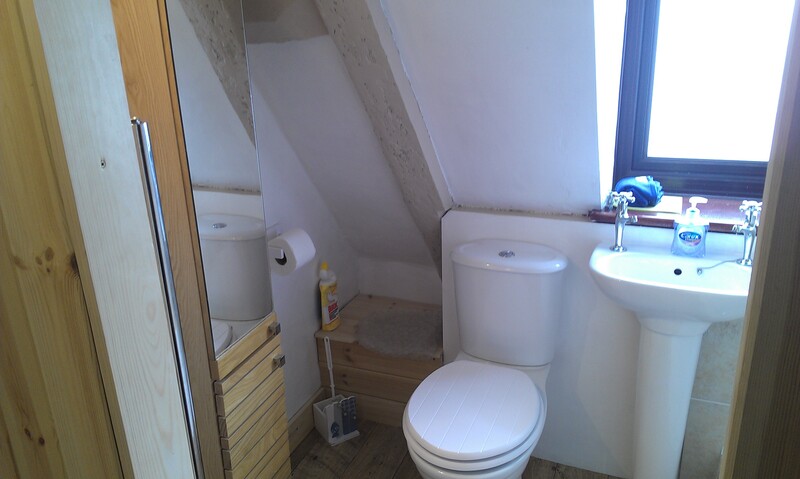 Both rooms and en-suite shower built into sloping attic roof with low doorway between the 2 main rooms. Good water pressure in the shower. 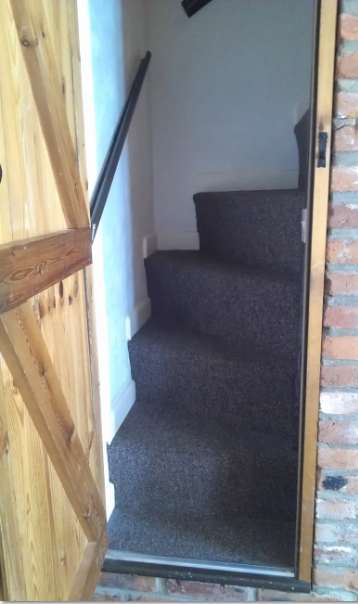 Norfolk winder staircase with 2 flights of steeper than normal stairs. Full 6.5 feet walking height through all the rooms, into the shower room and 6.2 feet in a part of the shower with sloping roof. Suitable for 2 adults and/or with 1 or 2 children over 11. Or 2 adults in separate rooms. Not suitable for anyone that is not fully mobile. Please do not book this room if you don't like steep stairs. King bed with top quality mattress. 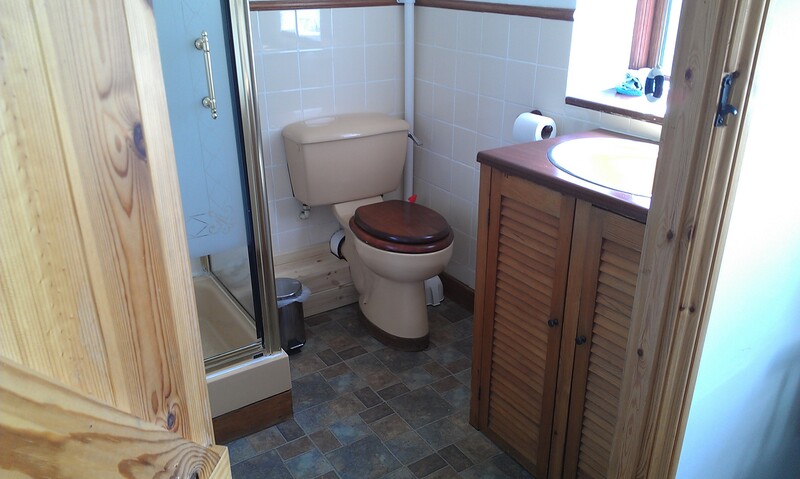 Slightly bigger en-suite enclosed shower room with normal water flow. 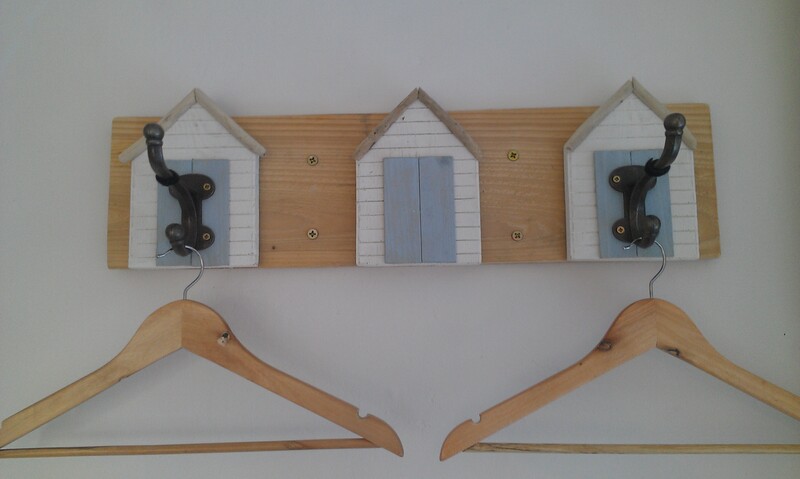 pine and shabby chic furnishings. Waste water pumped out by a macerator in the small en-suite room with enclosed shower which means it can be noisy when you use the water but does not disturb us or other guests. Good water pressure in the shower. Partial Harbour view from the top of your private staircase and entrance to Port room that features a port hole in the door. 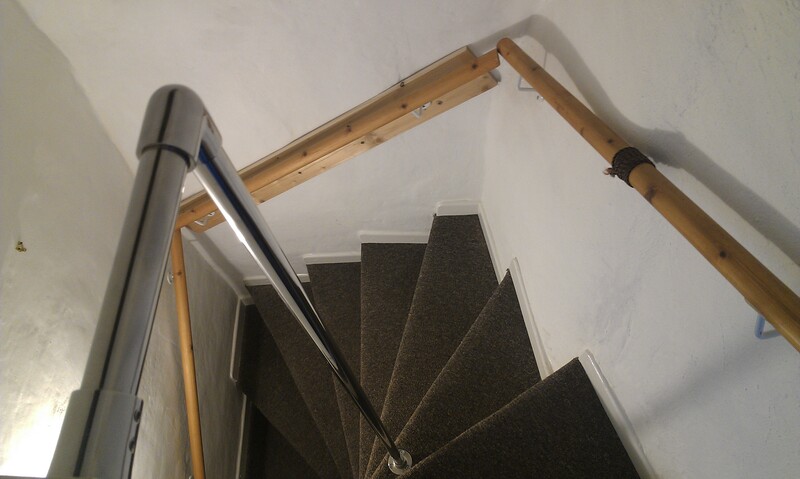 This room has a straight staircase for those that cannot manage our Norfolk Winders but must be pre booked. The room looks onto our quiet yard. 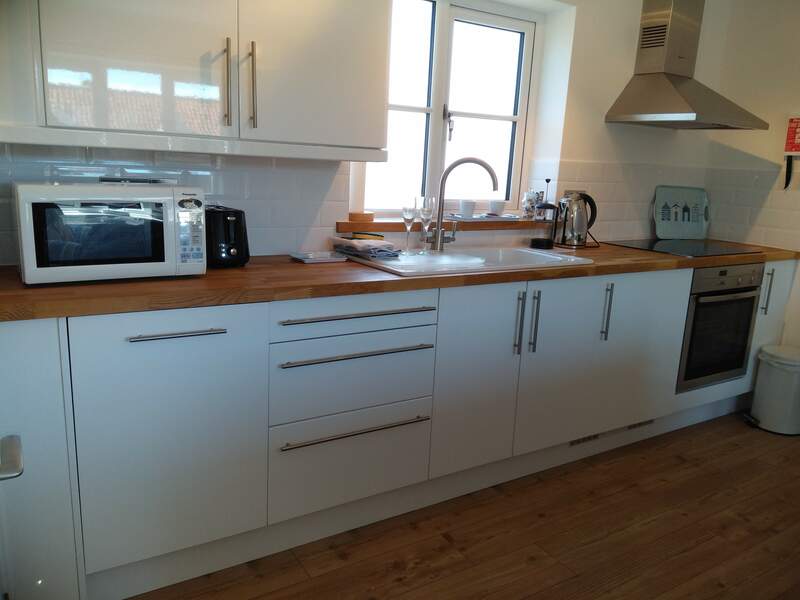 A few steps from the harbour, lovely 1st floor 1 bedroom modern apartment with king bed, shower room, well equipped kitchenette, dishwasher, oven and hob, lounge diner, comfy lounge and shared terrace with a partial seaview of the harbour. Rates and check-in days on request by email although you can check if it is available by entering your date and number of nights in the box above. 1 small to medium dog may be accepted if agreed with Avril before booking as conditions apply. The shared terrace at the front has partial views of the harbour just a few yards from you and there is a bistro table and chairs that you can take to the terrace and watch the world go by including the fishing and leisure boats. At Anchorage B&B and Apartments you will receive a warm welcome and feel at home straight away in our friendly B&B 2 minutes from the quay, a 16th century nautical themed cottage bed, breakfast and pet friendly self catering apartment in Wells-next-the-Sea with 3 comfortable king en-suite doubles, family suite with partial seaviews and our lovely 1 bedroom apartment a few steps from the harbour in Wells-next-the-Sea, close to the restaurants, shops, cafes open all year round and a lovely walk from probably the best beach in Britain and North Norfolk. See our rooms and apartment below. Booking is easy with just a couple of emails or text and Avril will email all the info. You can check availability by entering your date in the box above but this will not book, it will email Avril who will reply with booking information and hold it for a short time if possible. 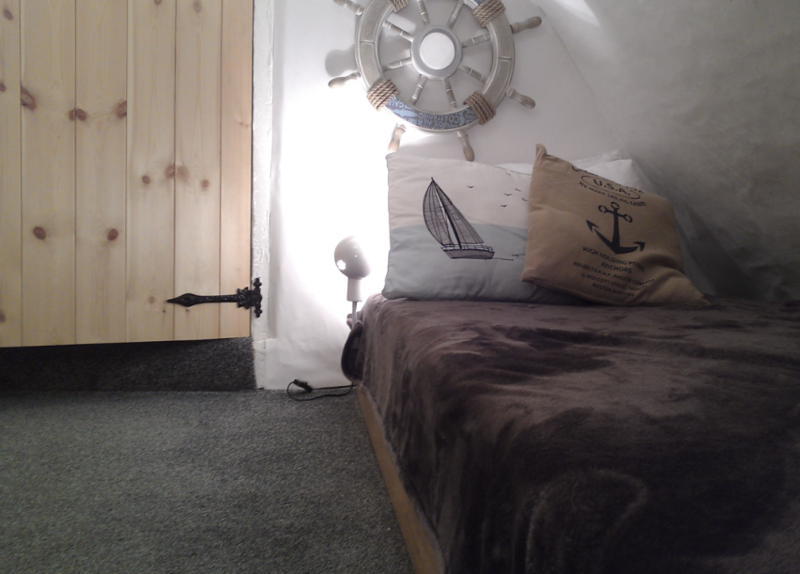 All our doubles are king size with a nautical theme and oak or shabby chic furnishings. 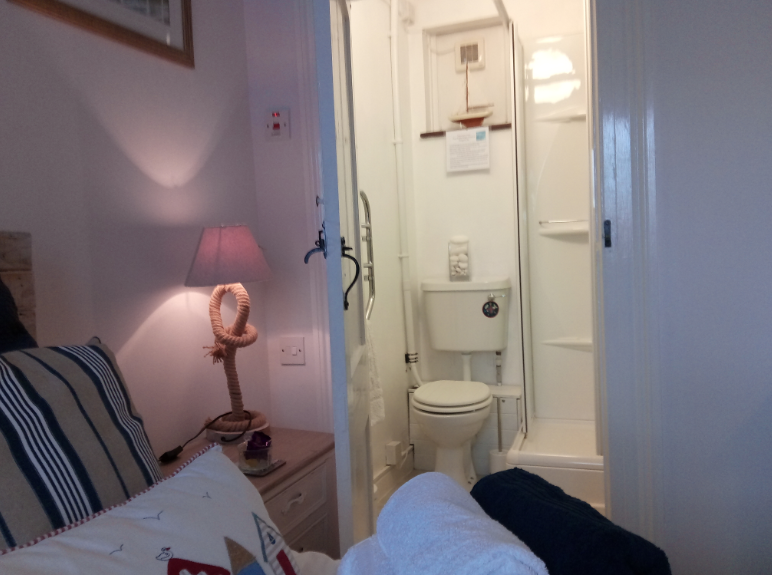 The Port king en-suite room has a small sofa, its own private staircase and large window in the entrance where you have a partial harbour view where you can see the sun rise. The waste water is pumped out by a macerator in the shower room that has a small enclosed shower. It looks out onto our quiet terrace and yard. 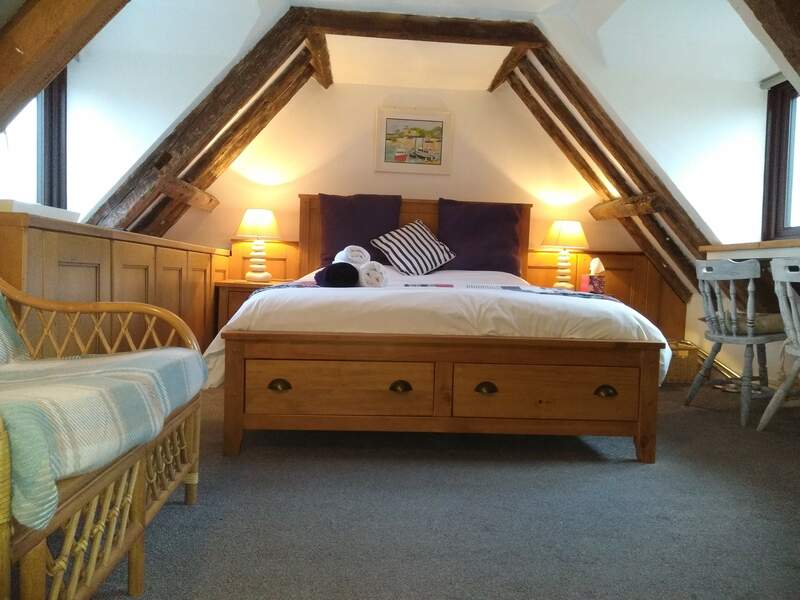 The Starboard king en-suite room with the best quality king bed is traditionally furnished in oak and is accessed via a Norfolk Winder staircase built into a former chimney with stairs steeper than normal. Our Top deck attic family suite is a favourite with many of our guests and has 2 separate bedrooms and en-suite shower room. 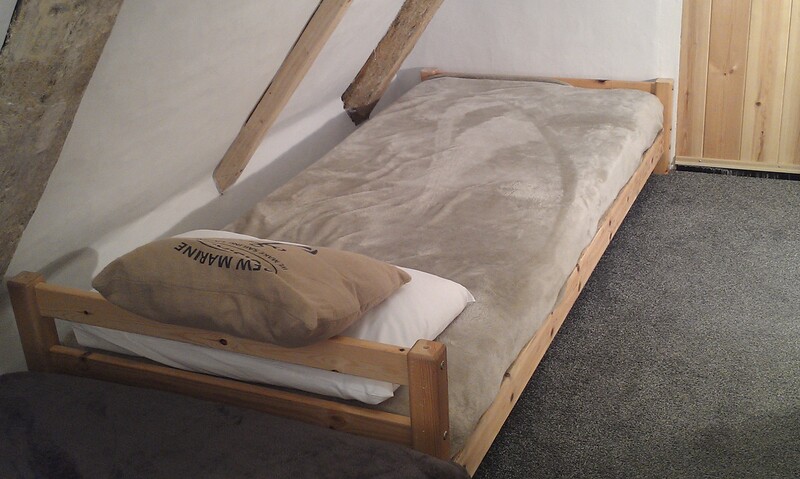 It has a king bed in the main room, 2 single beds (one full size and the other 2.6 feet and just above floor level) in a separate cabin style room and is all built into the sloping attic roof. 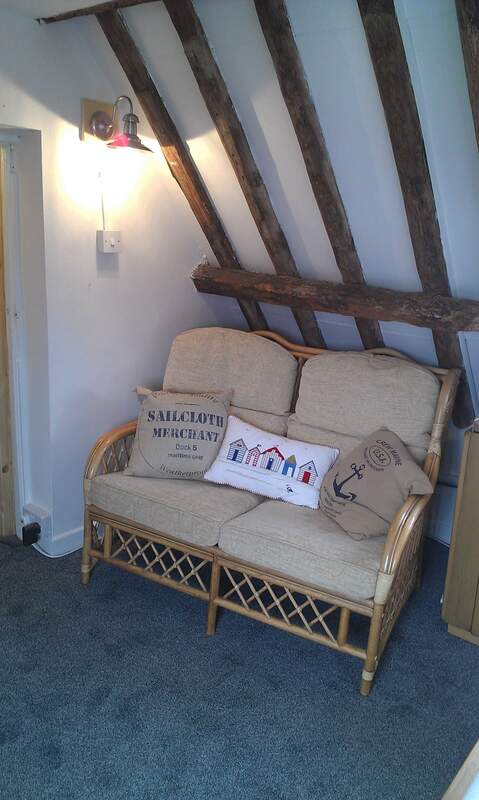 This room is accessed by 2 flights of a Norfolk Winder staircase with stairs steeper than normal. 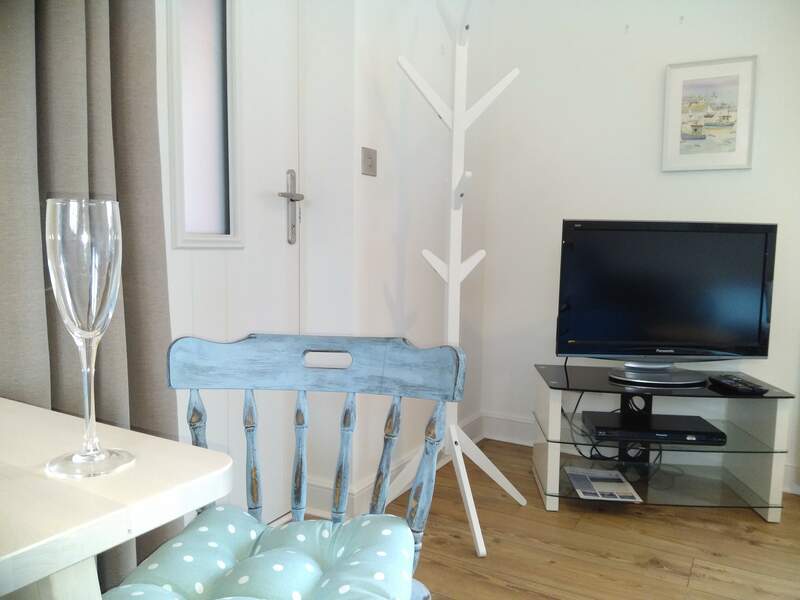 There is a low doorway between the rooms, a sofa, a sitting area and dual aspect partial view of the Harbour, Blakeney and Holkham pine trees. See the sun set on one side and the sun rise on the other. 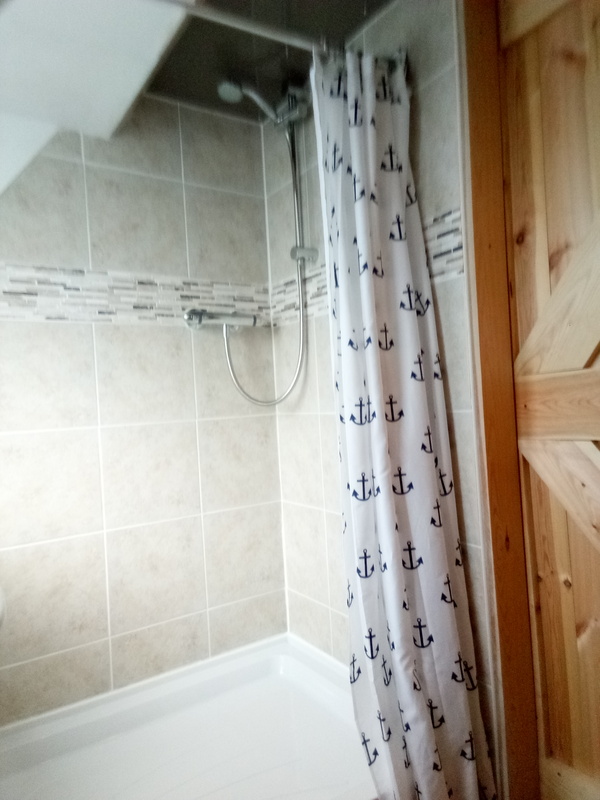 There is full head height clearance of 6 foot 5 inches through the middle of the rooms and 6 foot 2 inches in a part of the shower (the rest of the shower is sloping). Full height in the rest of the en-suite. The top deck is suitable for 2 adults, or 2 adults and 1 or 2 children over 11 years. Great if your child wants to sleep in a separate room. 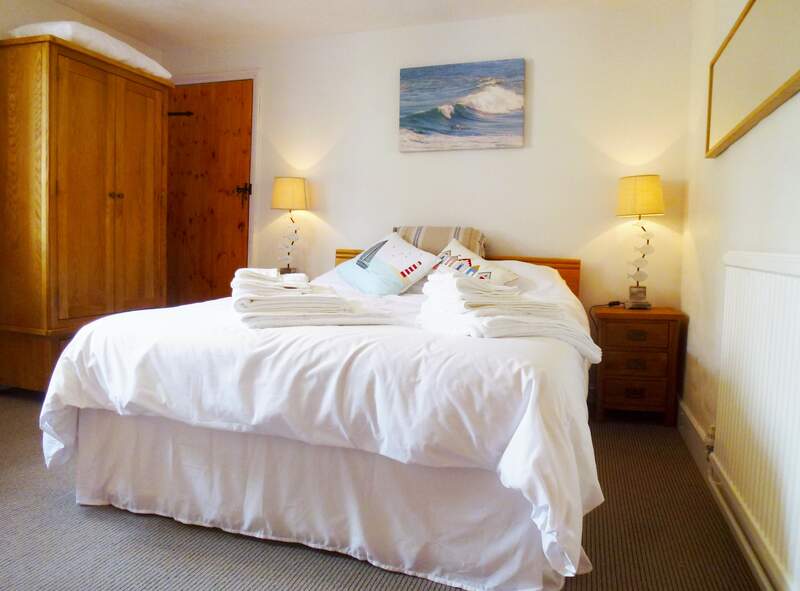 Or it can be used as 2 single rooms sharing the en-suite for 2 adults that want to sleep in separate rooms. Supplements apply for extra people or making up extra beds. You will have your own entrance from the front terrace and porch that is used for boots and outdoor gear. This leads into the guests dining room that has a fridge with fresh milk for your tea and coffee and filtered water. You can also use it for storing your snacks and chilling drinks. From the dining room the two staircases are accessed for the 3 guests rooms and an entrance into our area at the back making the front of the house exclusive for guests so that you can come and go as you please without disturbing anyone. We do not accept dogs in the B&B. 1 small to medium dog may be accepted in the apartment if agreed with Avril before booking (and not after) as conditions apply. 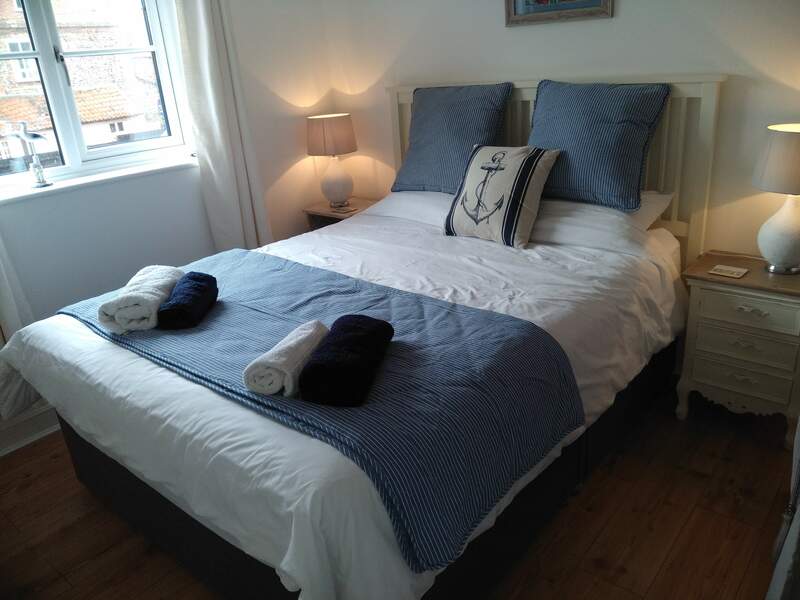 The Harbour Apartment is a couple of minutes walk from the B&B, closer to the quay and just a few steps from the harbour. 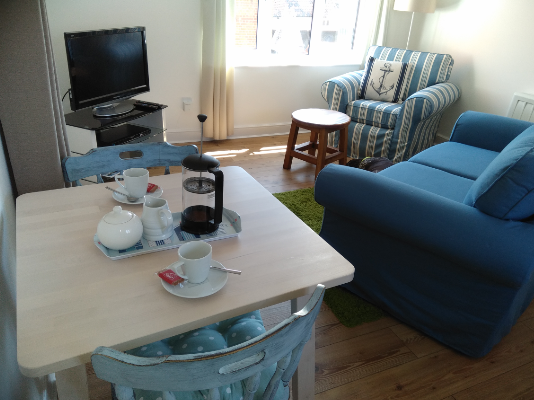 It is a lovely 1st floor 1 bedroom modern apartment with king bed, shower room, well equipped kitchenette, lounge diner, comfy lounge and shared terrace with a partial sea-view of the harbour where you can take the outdoor table and chairs to watch the fishing boats go by. The good sized parking space is opposite. It is also a BT wifi hotspot for free wifi and there is a good vodafone signal. Rates and check-in days on request by email although you can check if it is available by entering your date in the box at the top of this page. We ask that the apartment is left as found. 1 small to medium dog may be accepted if agreed with Avril before booking (and not after) as conditions apply, such as leaving the apartment with no trace of dogs... unlike most other accommodation providers. Our check-in time is between 4 and 5pm. If you would like earlier or later - see below. For the apartment you will be asked to text around 10 with your estimated arrival time and I will reply with the door code. We plan a number of commitments around your arrival time including activities in the community as I am a Coast Watch keeper, marine medic on call for seal rescue and a harbour commissioner, so please let me know with as much notice as possible if it changes. If not I may not be available for your check-in. I do like to do early check-ins so that you can get your bearings, so please advise this when booking and then you will need to text on the arrival morning around 10am so that I can reply to let you know when your room will be ready. Calls often don't come through but I always receive text and emails. If you don't text in time for me to rearrange with plenty of notice we wont be able to do an early check-in. We do not do night check-ins. I will sometimes arrange for a self check in if I am not available at your arrival time or if I am called out. To check-in after 5pm, or if you think you may be later, we will arrange for a key to be locked in the porch at the arranged time. To do this you must read and reply to an email with the code and information to check-in and read the check-in notes when you arrive. I also like you to text to say you have checked-in. If you have booked with breakfast there will be a menu for you to tick that you have seen it and cross off anything you don't want. We do not accept bookings with a night check-in if it is your first time with us. Check-out is 9.30 to 10am. Sometimes later on request. You can check availability and see rates by entering your date in the search box above. This will not book the room. Avril will hold the room and email the information. The room will be released within 24 hours if you do not reply. We prefer email and always give a quick response as I cannot always get to the phone when with guests or working around the B&B. I also answer text quickly. We use a number of reservation sites but the best price is always by booking direct with us by email. 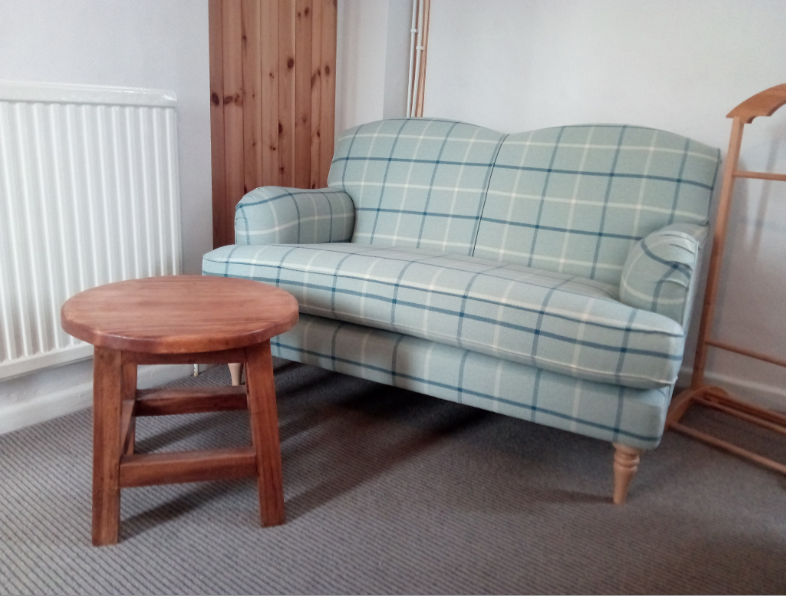 We are the best price on booking.com for a king room in a comparable area as we are a small independent B&B running just 2 to 3 rooms as efficiently as possible whilst providing a friendly, homely, clean and comfortable B&B experience for our guests. Rates range from £65 in low season to £120 in high season. Saturday nights is a minimum of 2 nights and in holidays it is a minimum of 3 nights except where less nights can be fitted in with other bookings. The apartment is a minimum of 7 nights in peak season. Prices based on two in a king bed. It is £30 per extra person in single beds. The top deck suite has a £5 to £10 supplement per night (2 rooms sleeping 4). 2 people can book the whole top deck and have a king and single in separate rooms £10 per night (the person in the single cabin style room must see the pictures before booking). 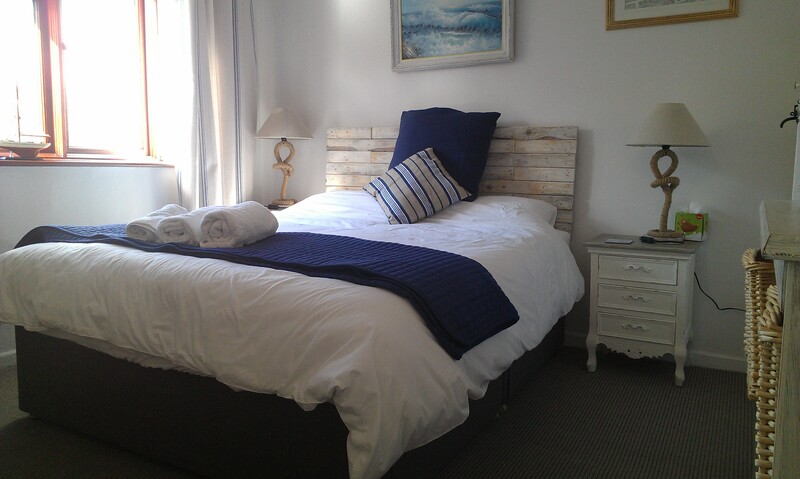 Rooms are booked with breakfast and the without breakfast rate is reduced or on self catering. The bed and breakfast price includes a set locally sourced home cooked full English breakfast served every day if you booked with breakfast. When you book it clearly states whether breakfast is included and an email is sent straight away confirming details and options. Due to activities in the community during peak season we do a discounted no breakfast option (even though we are already the best price in Wells for a king in comparable areas). Ideal for those visiting, early or late starts or just want to eat out. We will clearly confirm this with you when you book and confirm by email. If you book with breakfast included we will be serving breakfast on those days, but please do not book without breakfast if you want breakfast on site and we are only 2 minutes walk from the nearest cafe serving full English and only 5 minutes from other cafes, a delhi and bakers - so there is lots of breakfast choices that you can enjoy in Wells. For B&B guests help yourself to the wide choice for breakfast whilst I prepare the freshly cooked food served at the agreed time between 8.30 and 9am and ordered the night before. Including cereals, nuts, fruit and seeds, orange juice, 3 types of fresh bread for toast, jams, marmalade etc. and top up your pots of tea and fresh coffee as often as you want. Earlier or later breakfast of toast and cereals may be available by prior arrangement. We can only do one sitting for cooked breakfast 08.30 to 9am. Our set full English includes local butcher Howells sausage and bacon, field mushrooms, Heinz beans, grilled tomatoes and local free range scrambled eggs. On some days I include my favourite triple cooked potato bites or hash browns. Iron and alarm clock on request. The apartment has a well equipped kitchenette table and chairs and lounge which also has a sofa bed. Guest’s dining room with a fridge that contains fresh milk for your tea and coffees (toped up in the morning), filtered water and can be used for chilling your own beverages and snacks. No food is allowed in the rooms. Avril is allergic to fish (how annoying) so please do not bring anything back from our excellant fish and chip shops. You are welcome to use the dining room and terrace but please leave it as found. The porch has lots of towels for removing the sand and mud as our 16c drainage cannot cope with the extra and our linen and towels are white. Dark hand towel to help keep the bath towels white especially if you use hair dye like myself. We want our guests to feel at home, so if you need anything in your room or service please let us know as it is your private room while you are here, otherwise we do not go in your room again so no need to tidy while you are here. The lounge, with a large LCD screen, can be made available on request by prior arrangement and we can purchase sky passes for you so that you don’t miss those important sporting events. Guests have their own furnished terrace that captures the evening sun. Cancellation fees can be sent by cheque or bank transfer and will be 100% if cancelled within 2 weeks. The cost of the first night will be charged if cancelled outside of 2 weeks. Deposit by bank transfer for at least the cost of the 1st night and the rest can be paid by cash on arrival or by bank transfer at least 6 weeks in advance of your arrival. If you miss this date please pay by cash on arrival. If we book without deposit you agree to pay cancellation fees by bank transfer. Merchants Barn B&B's previous Host, John Christmas, occupied Merchants Barn for over 40 years and he sends his regards to guests that came here and he refers to as friends. As our name was similar to our neighbour we agreed to change and are pleased to take on the name of Anchorage. The definition of Anchorage being an area on the coast or harbour that is a suitable, secure and safe place to stay. The Harbour apartment has a parking space opposite. Parking at the B&B is not available for the next few months due to refurbishment. If you follow the directions that I send with your confirmation you will find it easier to find the parking space or best car park mentioned below. All of my guests have used free parking for most of their stay when they have parked and left it there. If you are concerned about parking, ask Avril to call you and she can give you the best options. On street parking is available nearby. Do not drive through our Blackhorse Yard as there is no parking in Blackhorse Yard and it is not suitable for motor vehicles. Freeman Street is only a few yards away and the car park is a 3 minute walk which is free between 1800 and 0800 hours during which time people usually get parked on Freeman Street when day trippers and workers have gone home. Please do not park in Merchants House which is a different Bed and Breakfast. There is no parking in Blackhorse Yard and it is not suitable for motor vehicles. Set your satnav for NR23 1FD and not our post code or Blackhorse Yard as it will direct you into the yard sign posted as not suitable for motor vehicles and at the wrong end. This postcode will make it easier to find parking as below. Follow the A149 around past the top of Wells until you see Holkham Road the B1105. When you arrive at Wells the road goes round to the left and then sharply to the right (fields and horses on your left then right). Just after this you will see the sharp right turn onto Holkham Road sign posted to the beach and carparks with a picture of a coach. Take this right turn onto Holkham Road which is a sharp right hand bend that almost double backs onto yourself. This road then comes onto Freeman Street the B1105. Pass the first car park on your left as this is short stay only. When you come to the houses start to look for a parking space along the road (avoiding yellow lines). Pass Blackhorse Yard on your right but do not turn into it, just after Brigg Square. Continue along Freeman Street until you get to the Crab House. If you havn’t found a space go into the car park called Stearmans Yard on your right. Stearmans Yard car park is only a 3 minute walk which is free between 1800 and 0800 during which time people usually get parked on Freeman Street. Please park up and come to check-in so that I can give you more information. Turn left out of the car park. When you walk into Blackhorse Yard we are the 2nd house on your left which is green. Within 3 or 4 meters you will see the apartment on your right up the 2nd set of steps and No. 14 parking space on your left. 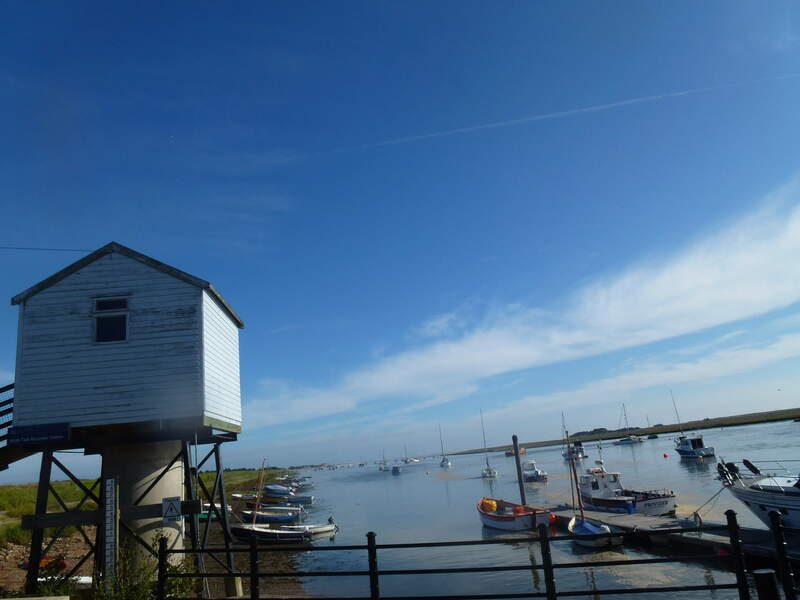 Wells is in the centre of the North Norfolk coast with beautiful white sandy beaches, salt marshes, pinewoods and sand dunes. 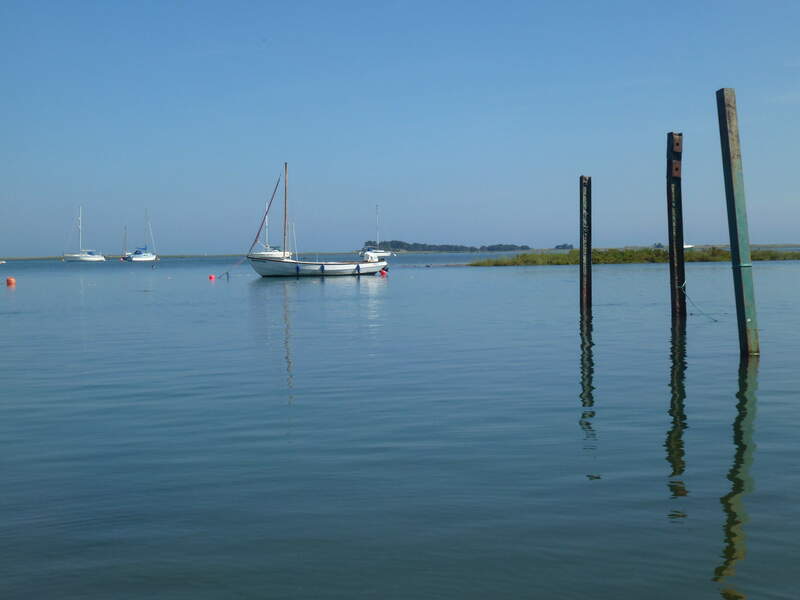 Wells has a small natural harbour, a large sandy beach surrounded by pinewoods, and thus caters for everyone and weathers. In summer the extensive beach and sand dunes are popular with families. The harbour is home to a small fishing fleet, but in summer is busy with a range of vessels from kayaks to sea going cruisers with several hundred moorings, some vessels mooring here all year round and a pontoon, often mooring visiting boats 3 deep during summer) that is currently being extended Northwards. In winter the salt marshes are home to very large numbers of geese and visiting waders. 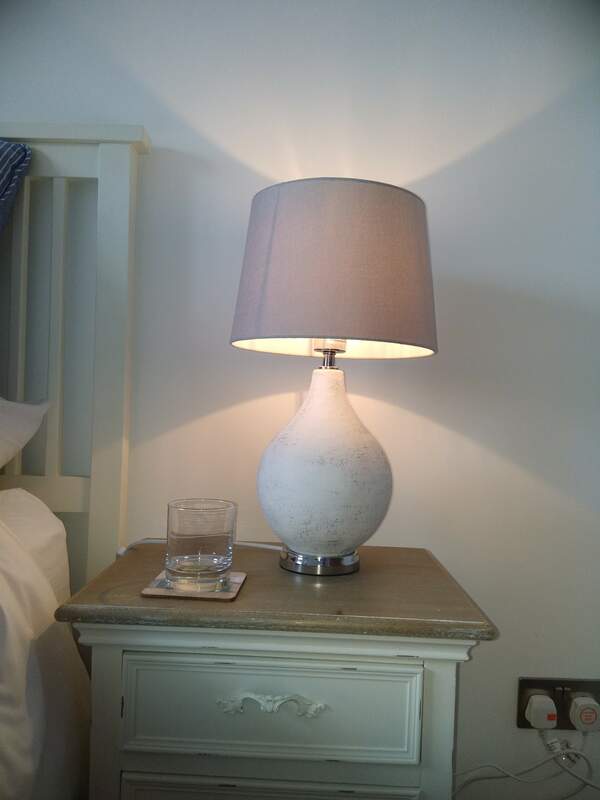 The house is situated about 200m from the quay in a quiet, small road known locally as a Yard. We will help you to plan your day, whether its local seaside villages, the best walks on our beautiful coast or the best birding sites. After breakfast ask Avril about her 3 favourite North Norfolk Coast walks. Wells next the Sea is popular with walkers as it is right on the middle of the North Norfolk Coastal Path and on the Peddars Way. 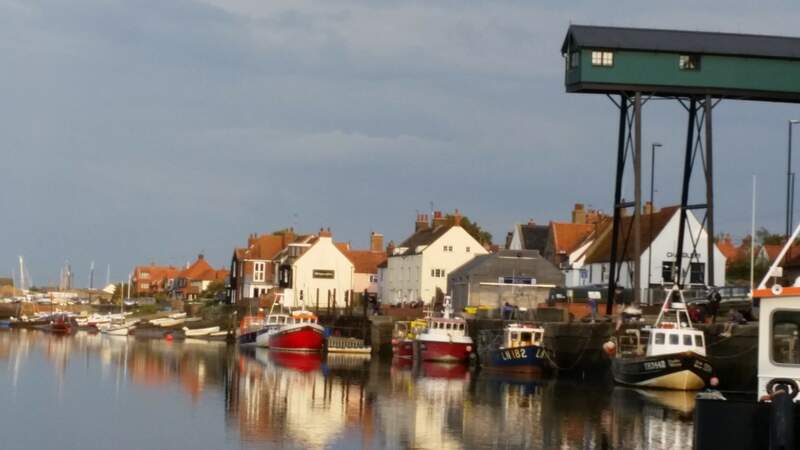 The Anchorage B&B and Apartments provides an ideal resting place as it is a few yards from the Path and on the bus route that stops off at every village along the North Norfolk Coast Path which is also a part of the Peddars Way. There is a secure place for your bikes and a convenient porch to leave your boots and gear. 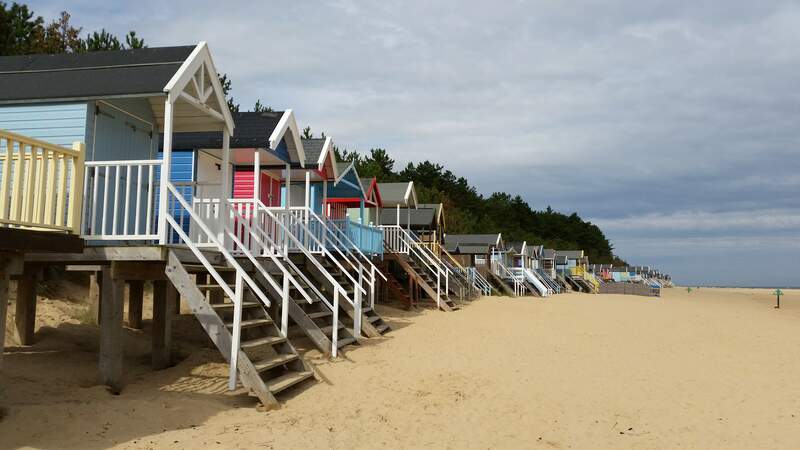 For those walking or cycling the North Norfolk Path or Peddars Way Wells is an ideal base with plenty of restaurants and shops available all year round (and saves you lugging all of your luggage around and packing/unpacking each day). The coast hopper is a great reliable bus service to use as transport to and from your start and finish points each day. 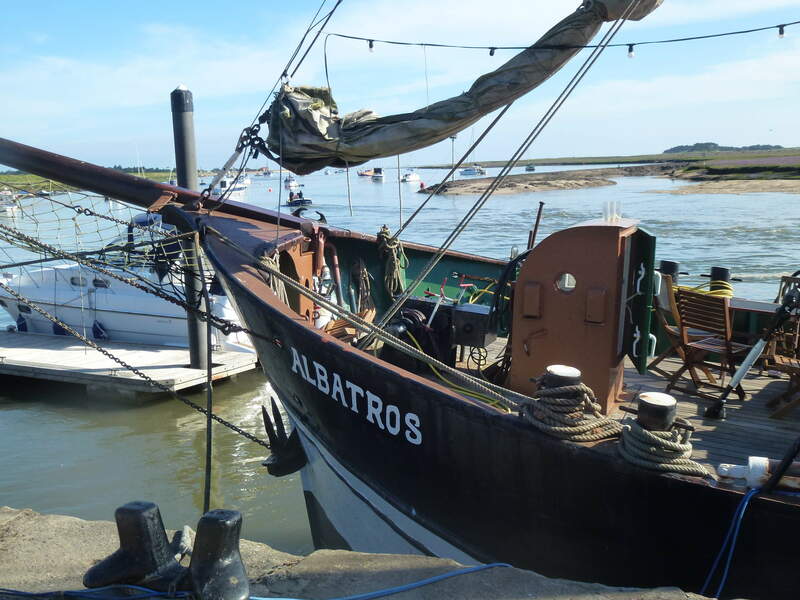 We have had a number of guests stay with us for 2 or 3 days and we have helped them to plan their routes to make the most of their stay and see as much of the North Norfolk coastal path and this beautiful coastline as possible. Many of whome will do Avrils 3 favourite coast and circular routes. We have some amazing birds here all year and stopping off on their way home for summer or winter. The pink footed and brent geese are arriving in October with their wanderfull chatter and formations over the B&B and across the sky all winter. We are just off the marsh where you can see the murmuration of starlings, an amazing sight - a swooping mass of thousands of birds whirling in the sky above your head. 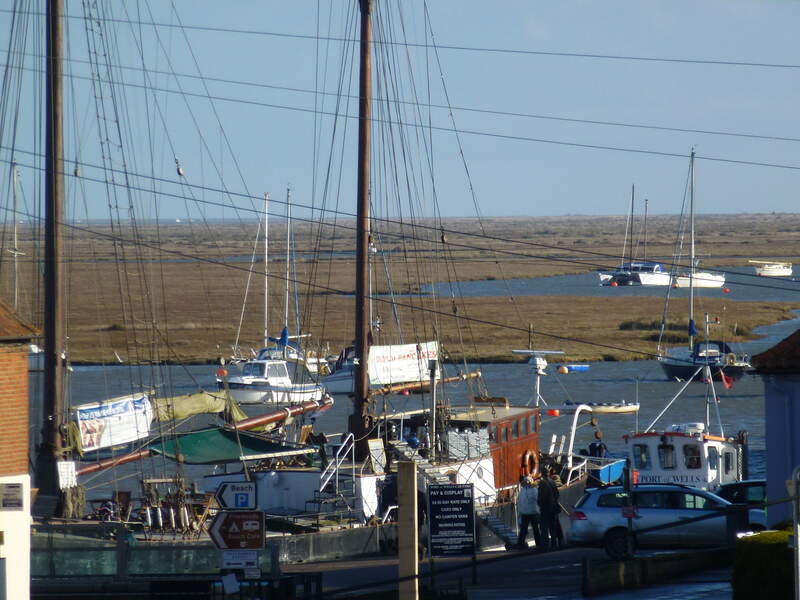 Wells is very popular with birders, situated between the RSPB reserve at Titchwell and the NWT reserve at Salthouse. There are also reserves at Snettisham and Welney, within easy travelling distance. Plenty of bird books and local knowledge is available to help with identifying wildlife spotted.